Although we are a little behind the times, PRI can now be found on Skype™! We are excited about the opportunity to collaborate with other PRC therapists live! This technology will give us the capability to consult, while actually seeing the patient and therapist! If you are already connected to this network, you know how great it is…but for those of you who are not, check it out! Read all about Mara Brandsoy, OTR/L, PRC this month! Mara was the first occupational therapist to becomecertified in PRI! To read her entire interview, click here! Raulan Young, MPT, PRC has written a case study about the treatment Lateral Femoral Cutaneous Neuropathy using PRI! To read this case study, click here! This was the topic of the presentation given by Jeanna Viramontes, MPT, PRC to a breast cancer support group at United Hospital in St. Paul, Minnesota. “What better lymphatic pump is there than a ribcage and pelvic floor with ZOA”? To access this presentation, click here. 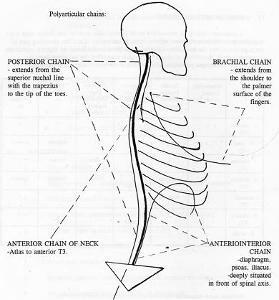 Over the years, several individuals have requested that we write something explaining what Postural Restoration is at a level of patient understanding. Most recently, someone asked us to add something to our website that would help educate individuals who are unfamiliar with PRI. Ron Hruska glady fulfilled this request and we are excited to start using this piece of literature to help educate and inform those that are interested in PRI. For those clinicians practicing PRI that also needed an explanation to handout to your constituents, here it is. The cost is $28. To order, please contact us. Our 2009 Postural Restoration Certification (PRC) Application Review Committee has been finalized. Each year 4-5 PRC therapists review the applications offering specific feedback and recommendations to each applicant. The committee is revolving so each year a new member is selected from the previous class. This year the committee includes: Jason Masek, Jen Poulin, Lori Thomsen, Michal Niedzielski and Kyndy Boyle. With the committee finalized we’re ready for applications to begin arriving. Anytime from now until September 15th applications may be submitted for review. Approximately 4 weeks after submission, applicants will receive feedback and recommendations that will assist them in determining their readiness for the PRC examination process in December. In addition, the Reviewer’s will guide the applicant in specific areas of study prior to PRC.